One of the most important features of Web Platform Installer, version 2 RTW of which released in September, is that it surfaces web applications offered by Windows Web App Gallery. The Gallery is the place for open source apps that can be submitted through online submission process and be available through various sources, including Web PI, to millions of people. Both submission and admission is totally free, the application just needs to adhere to App Gallery Principles and be a Web Deploy zip package. However, you don’t need to submit an app to the App Gallery to make Web PI install it for you. With a new feature that version 2 comes with – extensibility – deploying your custom application via Web PI becomes a piece of cake. This article will show you how to create a custom feed for Web PI to recognize your application and be able to install it. All you need to start with this article is a Web Deploy zip package of your app and (optionally) an icon for the prettier UI display of your app. 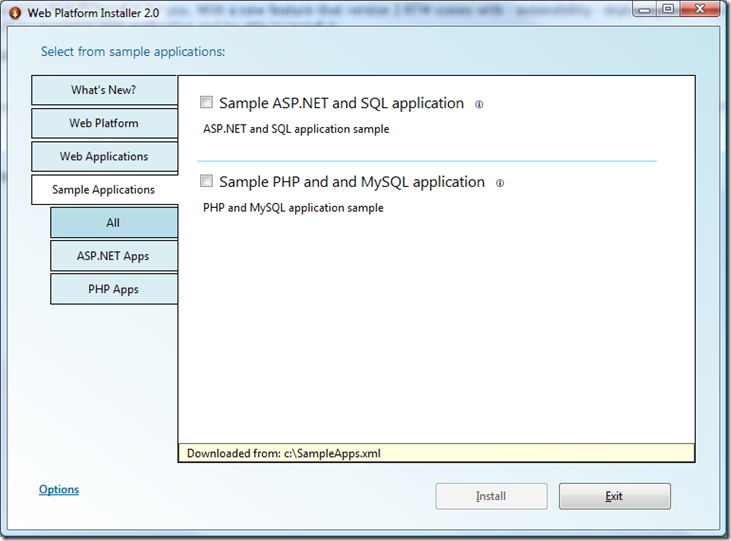 The feed below represents an example of how to add applications with ASP.NET/SQL and PHP/MySql dependencies, create a new tab and subtabs based on keywords, group products together and hint Web PI that your product is available in different languages. Please note that you have to define a new custom tab for your custom products, since they cannot be added to Web PI core tabs. WDeploy, SQL Management Objects and URL Rewrite. You can get a hash of your zip package, by using a free utility called File Checksum Integrity Verifier (FCIV) and running fciv.exe –sha <path to your zip package> from the command prompt. Now, you can try the feed out by saving it locally or uploading it, opening the Options dialog and adding a feed through either a physical path or URL. Note how applications are grouped based on keywords rather than product families like products do. Also, applications are grouped into keyword subtabs rather than group boxes (pillars for products). To read about adding a custom product through a custom feed refer to this article - Web PI Extensibility: Custom Feeds – Installing Custom Products. What is the difference between "Installing Custom Applications" and "Installing Custom Products" in the other article? Thanks, this _very_ useful for us (sensenet.hu). 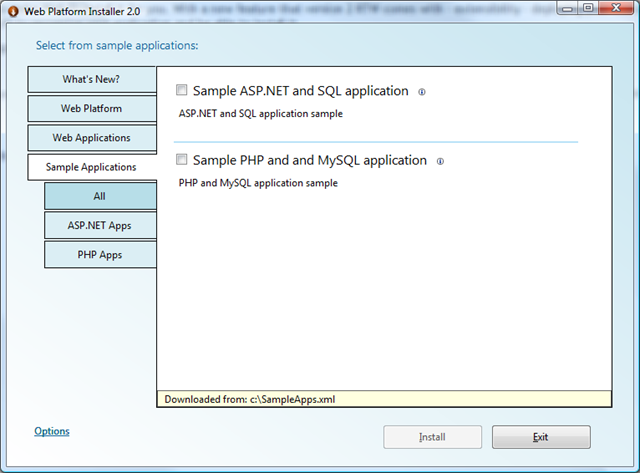 The only difference I see between the 2 types is that msDeploy sample exist only in the custom app sample xml. For Web PI there is not much difference between your product entries as long as you hint it one of them is of type "application", which will mean a) it is a zip package and b) Web PI should install it using Web Deploy. This way, you can actually combine feeds from both article into one feed that will define both - applications and products. The problem with the feed was that there is no more product with productId = UrlRewrite2RC1, because URL Rewrite 2 RTW just got released a couple of weeks ago and the productId changed to just UrlRewrite2. So I updated the feed and added the link to the latest version. - this will delete Web PI installer cache, clear all feeds and set the language of installers to the deafult language (language of your locale or English). The deliverables are not for IIS, thereby I will not be using Web Deploy. They will be SDKs and Developer Tools. I am curious if I can call an executable within the command shell? Is it possible to execute a shell command from Web PI’s sandbox? As of right now executing shell commands is not supported for application installs. The reason for this is that Web PI supports remote installation of applications and having install commands defined for an application would break this scenario. We are looking into working around this in v3. Thanks for this sample - it was great help! What I'm unable to find documentation on is how to specify .Net v4.0 as a dependency - I expect I can specify such a dependency in an element below //dependency/productId but any information on this would be greatly appreciated.